It’s about time for another recipe post. I think I’ve mentioned before how much I love my crockpot. The crockpot is seriously the parent’s best friend. I almost said “working parent’s best friend,” but then I realized we use our crockpot just as much on the weekend as we do during the week. It’s just so nice to throw a bunch of stuff in the crockpot and then, magically, have dinner ready at night! Today’s recipe is the easiest recipe you will ever find (other than maybe pouring milk on cereal). You ready? 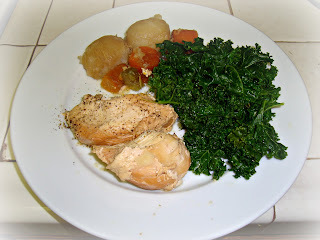 Ok, here’s what you need: chicken breasts, 1 cup of liquid, and whatever other vegetables you want, if you want them. That’s it! Place the chicken breasts in the crockpot, add the vegetables, and then pour the liquid over all of it. Set it on low for about 8 hours (though honestly, I’m usually out of the house for about 11 hours on weekdays, and it’s been fine). The best thing about this dish is that there are about a million variations you can do with it. One time I added ½ a cup of white wine and some lemons (which was super yummy). I think my favorite variation was to use a container of salsa instead of the chicken broth. Then I sprinkled some grated cheese on top just before serving. So yummy! I also like my rice cooker as a "magic" meal: Put rice and a package of uncooked sausage links and water in the rice cooker. When the rice is done, so is the sausage (works with frozen or thawed meat). Add a vegetable or salad. Ding! Try it with brown rice too!